Halifax data shows the market has been slowing up since July. The latest in the monthly merry-go-round of house price surveys demonstrates pretty conclusively what everyone has been suspecting for a while: the housing market has come off the boil (technically, that means there wasn’t a bubble, as by definition those pop). 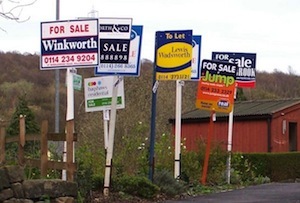 The average British home cost £186,135 last month, according to Halifax’s October House Price Index (which looks at the building society’s mortgage approvals, excluding the cash buyers who made up 40% of purchases in 2011), down from £186,898 in September. It’s when you look at the change in price growth, though, that you can see the property market visibly cooling down. While the monthly measure is all over the shop (house prices fell for five of the last 12 months, according to Halifax), quarterly and annual house price inflation both peaked in July. The former veritably plunged from 2.7% in September to 0.8%, while the latter has slipped to 8.8% from its high of 10.2%. Good news for wannabe buyers and the economy in general (everyone and their Mum had started pontificating about the dangers of another property crash), less so for estate agents, mortgage lenders, housebuilders and those looking to sell up.